CFL commissioner Randy Ambrosie addresses the media a news conference at Grey Cup week in Edmonton, on Nov. 23, 2018. The Grey Cup game is returning to Regina and Hamilton. The CFL announced Thursday night that it’s awarding the 2020 Grey Cup to the Saskatchewan Roughriders and the 2021 contest to the Hamilton Tiger-Cats. 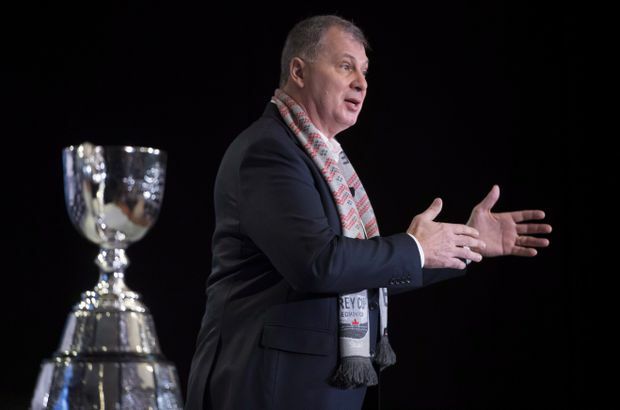 “Congratulations to Saskatchewan on winning the bid for the 2020 Grey Cup,” CFL commissioner Randy Ambrosie said in a statement. “It’s exciting the Roughriders and their legion of fans, among the most passionate in all of sport, will cap the club’s 110th anniversary by welcoming the biggest event in Canadian sport. The Riders, Ticats and Montreal Alouettes had all bid for the 2020 title game. This year’s Grey Cup will be held at Calgary’s McMahon Stadium on Nov. 24. The 2020 Grey Cup will be played at the new Mosaic Stadium. It returns to Regina for the first time since 2013, when the hometown Roughriders defeated the Hamilton Tiger-Cats 45-23 for their most recent CFL championship. The 2021 contest will be held at Tim Hortons Field. The game will help celebrate Hamilton’s 175th anniversary and comes 25 years after the city last hosted one of the most memorable Grey Cup games in CFL history.